Loyal Housecarl is an epic Willpower creature card. It is part of the Core Set. In addition to the card's availability in the Core Set, one copy is included in the Band of Survivors deck. "By our service we honor Kyne." This card's summon ability applies the Get in the House card effect. 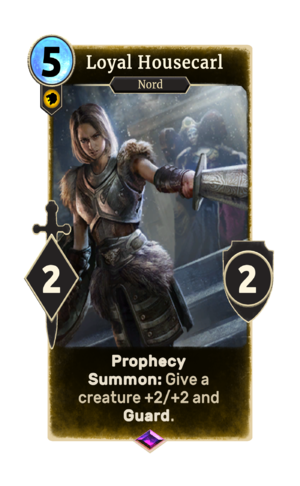 The card's art depicts a housecarl standing in front of Laila Law-Giver, the jarl of Riften in Skyrim. This page was last modified on 15 February 2019, at 12:08.